Security Shield is not a legitimate security tool. It is a malware that pretends to be an antivirus but, in reality, can not remove viruses, trojans, etc., nor will be protect your computer from legitimate future infections. SecurityShield created with one purpose to trick you into purchasing its full version. Security Shield is promoted and installed via trojans. Once started, it will be configured to start automatically every time when the system loads. 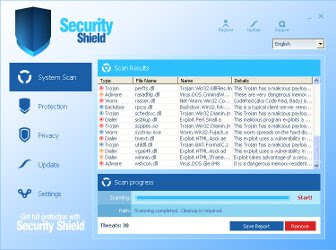 SecurityShield will begin a fake system scan and detect a lot of viruses that can only be removed with a full version of the program. Important to note, all of these viruses are a fake and don`t actually exist on your computer. Obviously, such results are a fraud, the program want to scare you into thinking that your computer is infected with malicious software. While Security Shield is running, it will flood your computer with fake security alerts and notifications from Windows task bar. All the alerts are totally fabricated and must by no means be trusted! As you can see, SecurityShield is absolutely useless and what is more, even dangerous software. Most importantly, do not purchase it. Instead, please use the Security Shield removal instructions to remove this malware from your computer for free.